Take a bite of this burger, cowboy (or cowgirl). Can you smell the campfire? It’s the A.1. sauce-onion-cheese combo. Make some for your posse tonight. Grill patties 5 min. on each side or until done (160ºF). Meanwhile, heat oil in large skillet on medium-high heat. Add onions; cook and stir 10 min. or until golden brown, stirring frequently. Stir in steak sauce. 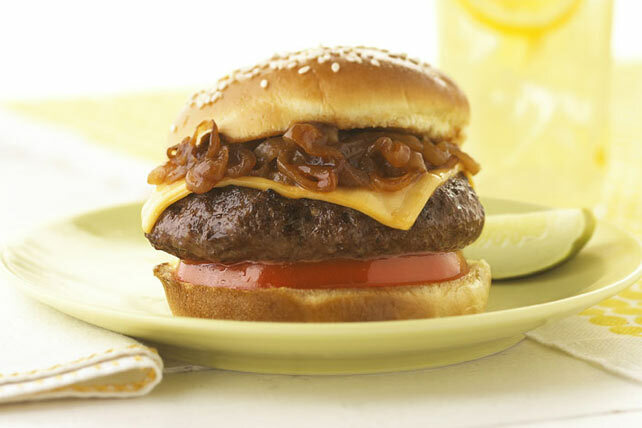 Fill buns with tomatoes, burgers, Singles and onion mixture. Prepare using whole wheat rolls and KRAFT 2% Singles. There's no need for a separate melt step for these cheeseburgers. The heat from the hot burgers and onions will melt the Singles perfectly.